The pomegranate tree grows well in Oregon home gardens in the western half of the state where the USDA hardiness zones are 7 through 9. The pomegranate tree will not tolerate temperatures that fall below 10 degrees F. Pomegranate trees require little maintenance once the tree becomes productive after three years of growth. The tree will produce fruit for up to 15 years after planting when given adequate care and water. Choose a planting location for the pomegranate tree that has well-draining soil and bright sunlight for a minimum of eight hours each day. Select the warmest part of the home garden in Oregon for best results. Test the soil pH prior to planting as pomegranate trees grow best in an acidic soil of 5.5 to 7.0. Add ground rock sulfur and work it to a depth of 8 to 10 inches to lower the soil pH if necessary. Let the soil rest for two weeks after making amendments. Plant the pomegranate tree in a hole that is the same depth and twice as wide as the root ball of the tree. Mix organic compost into the soil removed from the hole and pack it around the roots to hold the tree in place. Prune the pomegranate tree after planting to a height of 1 foot. Gradually prune branches so that there are four to five branches evenly spaced around the trunk once the tree reaches a height of 2 feet. This will train the tree to form a strong branch crown. 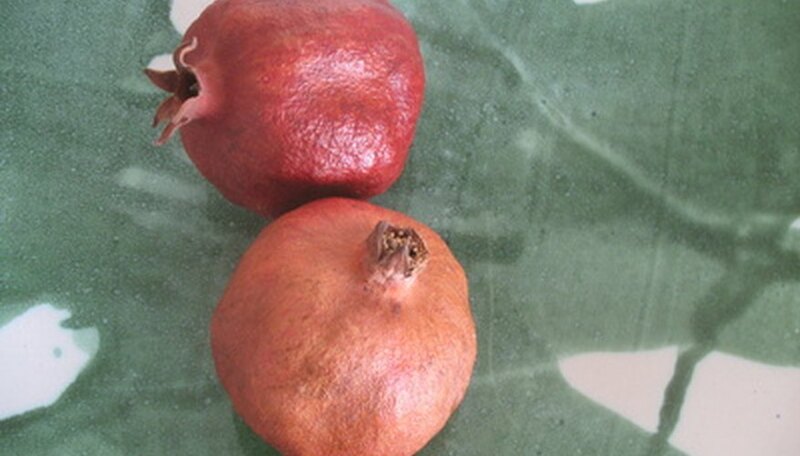 Apply water to the soil around the pomegranate tree after planting to moisten it to a depth of 10 inches. Provide supplemental water to the tree every day for two weeks after planting. Continue to provide deep-water soakings to the soil around the tree during the hot summer months in Oregon when the weekly rainfall is less than 1 inch. Apply an 8-8-8 fruit tree fertilizer to the pomegranate tree each spring and fall at a rate of 2 pounds for small trees and 4 pounds for large mature trees. Do not fertilize the pomegranate tree the year of planting. Prune sucker stems growing around the base of the tree and out of the soil over the root ball as they appear. Prune stem shoots by removing several inches each spring season during the first three years after planting to increase branch growth.